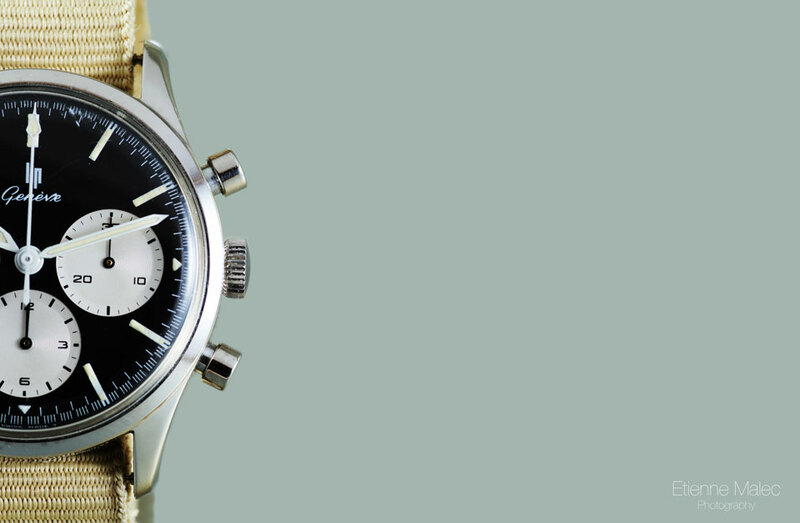 A contemporary take on the MonoPusher chronograph watch commissioned in 1945 by the MoD. 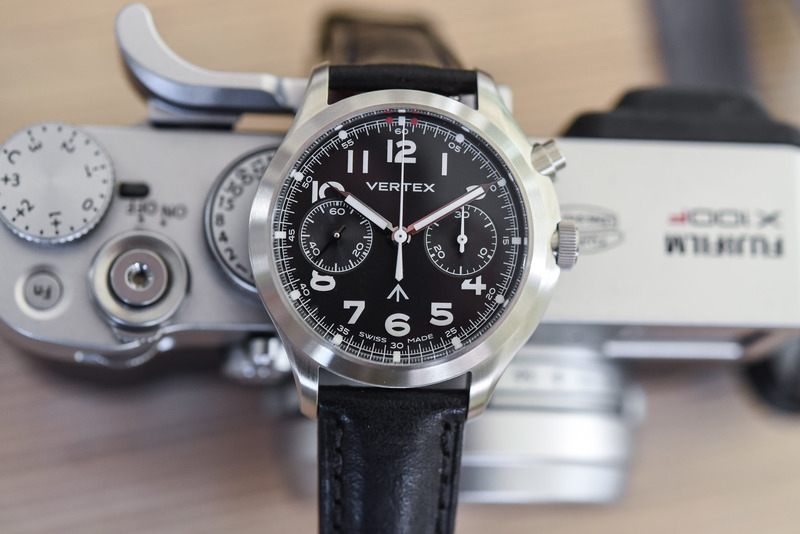 The luxury watch industry is in somewhat of a confusing and unpredictable place at the moment. You have the Swiss and German giants behaving even more conservatively than usual (with some obvious exceptions, like the four-armed Patek Philippe Ref 5520P). You have Seiko doing some interesting things out of Japan. 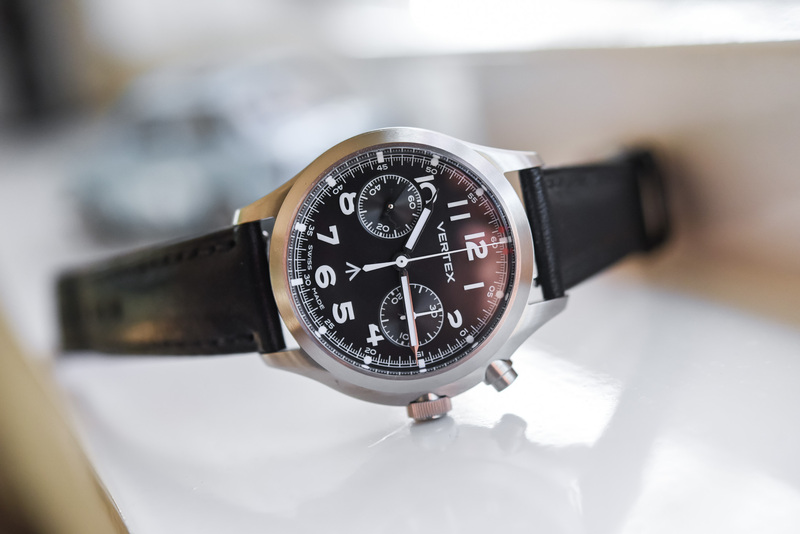 And you have a myriad of small – some even micro – brands, making legitimately cool and intriguing watches. 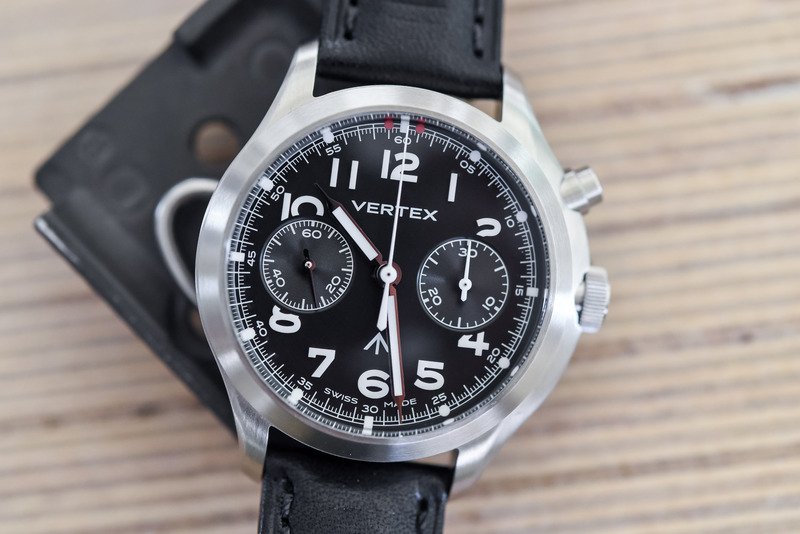 British watch brand Vertex falls very much into this last category. The company’s latest release is the MP45. We were lucky enough to get our hands on one for a few days. Here’s what we thought. 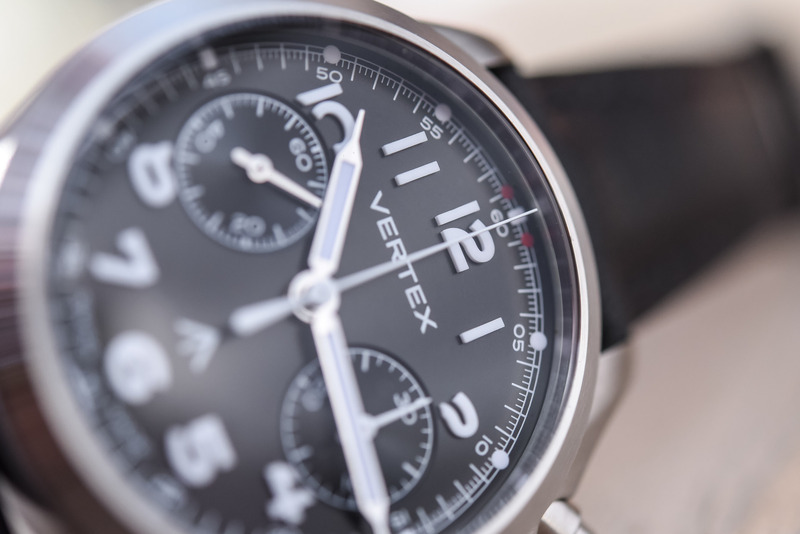 As you may already know, Vertex is not a new brand, at least not in the traditional sense. Rather, it is newly “revived”. 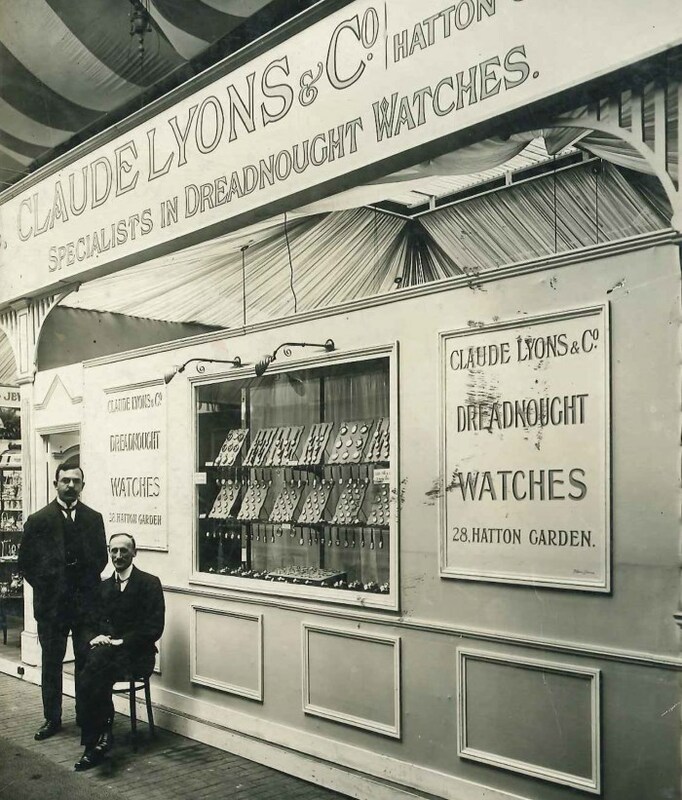 Established in London in 1916 by Claude Lyons as Vertex Watches Ltd, the company is arguably best known for being the only British member of the Dirty Dozen (more on that in a minute). 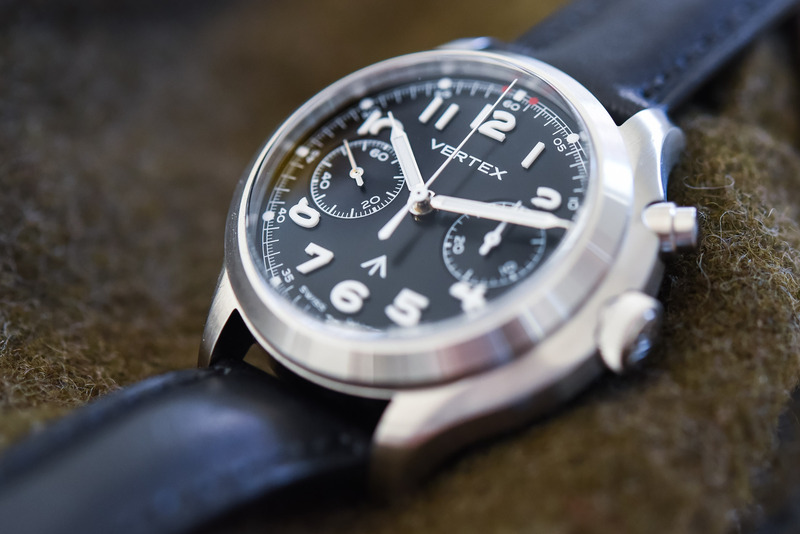 Producing watches for both military and civilian use, Vertex was based in Hatton Garden, London’s well-known watch and jewellery enclave, for almost five decades. The company hit hard times in the early 1970s though, like so many in the industry at that time, and became yet another casualty of the Quartz Crisis. After lying dormant for over 40 years, a gentleman by the name of Don Cochrane – who happens to be the great-grandson of the original founder – reincorporated the company in 2016. 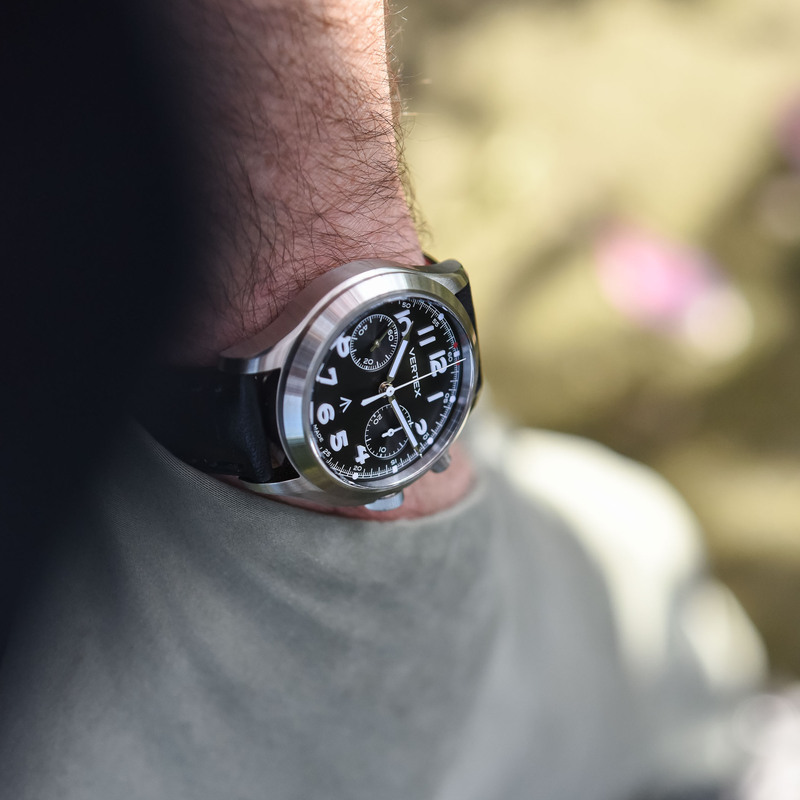 Adopting a less is more approach, he used the requirements set out by the British Ministry Of Defence (MoD) for what would become the Dirty Dozen as the basis for the new watches. What were those requirements you ask? Let’s take a look. 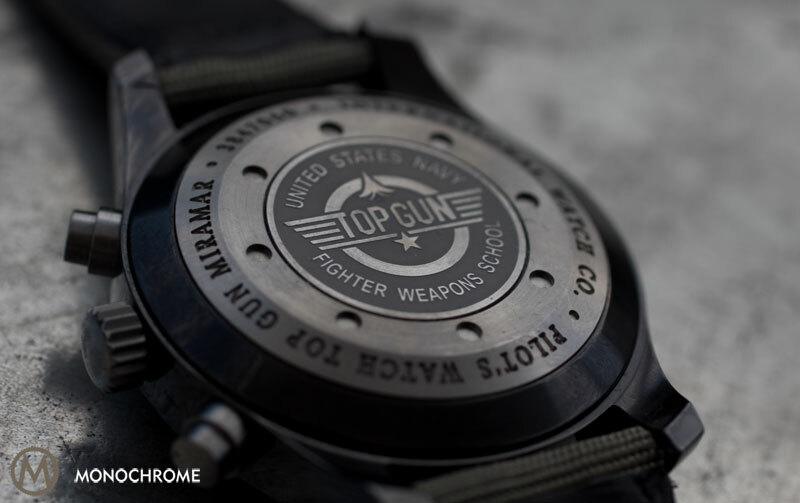 If you’re a military watch buff, then you will already be familiar with the Dirty Dozen. For those who are not, I will do my best to provide a brief summary here. 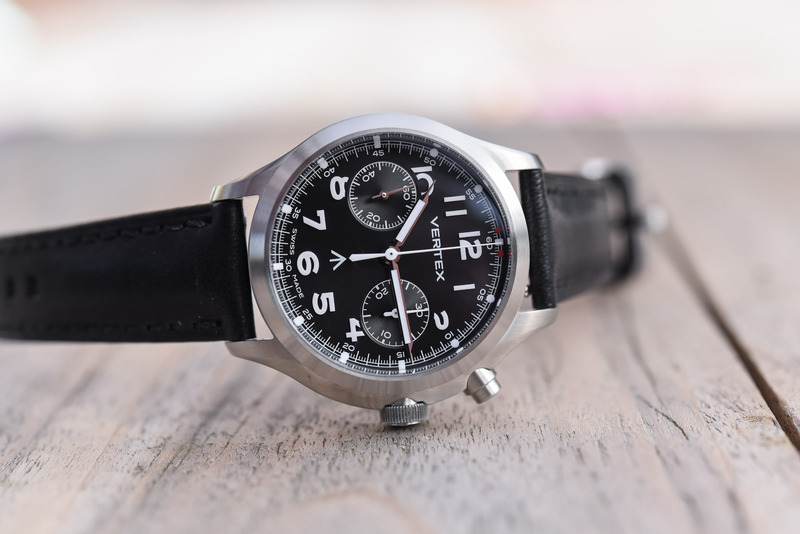 Essentially, the Dirty Dozen is a set of military watches – known as WWW’s (Watch, Wrist, Waterproof) – that were created for the British Military under the auspices of the MoD, during World War II. “Dozen” refers to the 12 individual models created by the 12 chosen companies: Buren, Cyma, Eterna, Grana, Jaeger-LeCoultre, Lemania, Longines, IWC, Omega, Record, Timor, and Vertex. The 12 watches that compose the “Dirty Dozen” – image by A Collected Man. 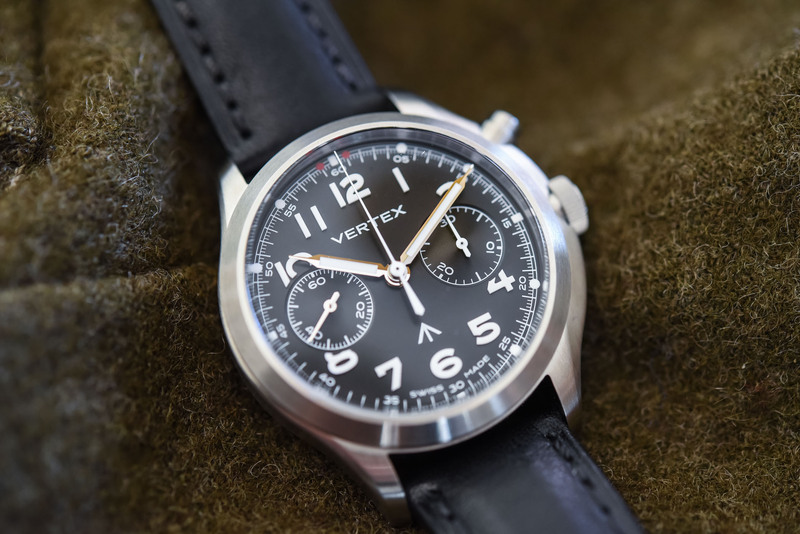 Following this commission, Vertex, working with four Swiss factories, began producing the Cal 59 Nav watch in 1944. 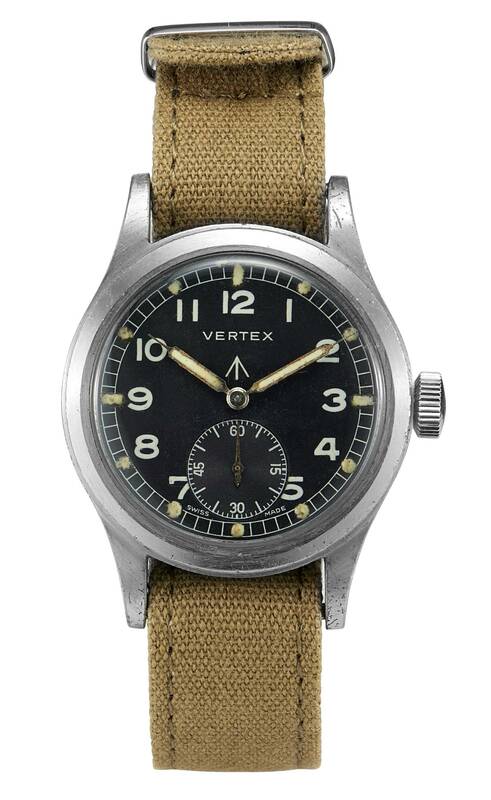 In total, around 150,000 W.W.W’s were supplied to the British military by the Dirty Dozen between May 1945 to December 1945, of which Vertex contributed approximately 15,000 pieces. We will revisit the Dirty Dozen in more detail in a later article, so stay tuned if you would like more information. 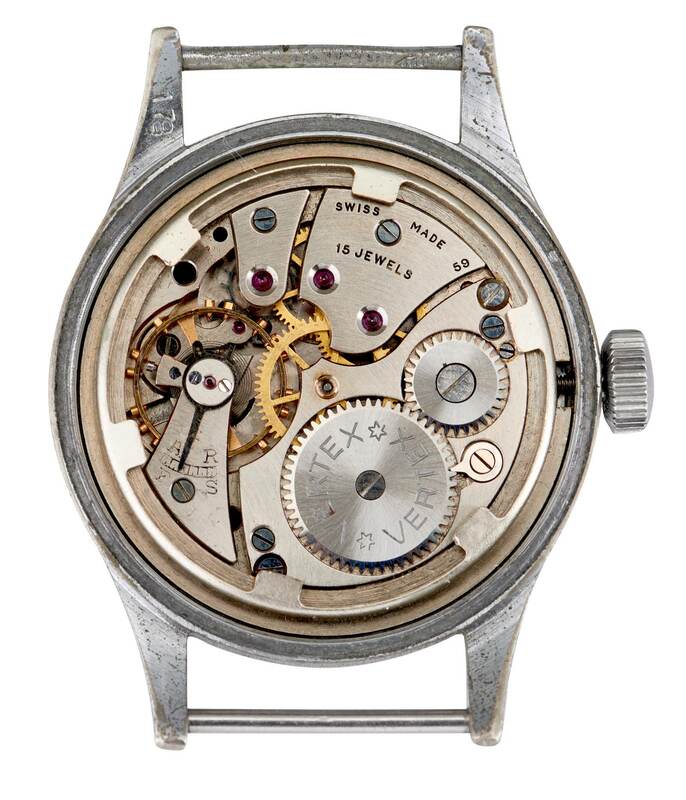 A prototype was made but the watch never saw production, in part due to the heavy rationing in place towards the end of the War that limited the number of movements that could be brought into the UK. 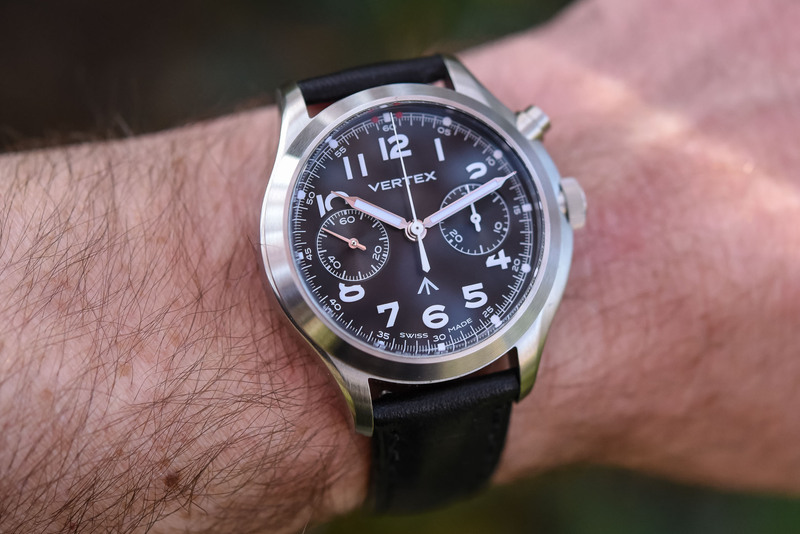 The unconditional surrender of the Axis powers shortly thereafter marked the official end of the bloody conflict and Vertex returned its focus to civilian watches. Given that there was no longer a need for the MP45 it was relegated to archives and presumably forgotten. Until recently, that is. Officially unveiled earlier this year, the commercially produced MP45 is presented in a 40mm case made from brushed steel. 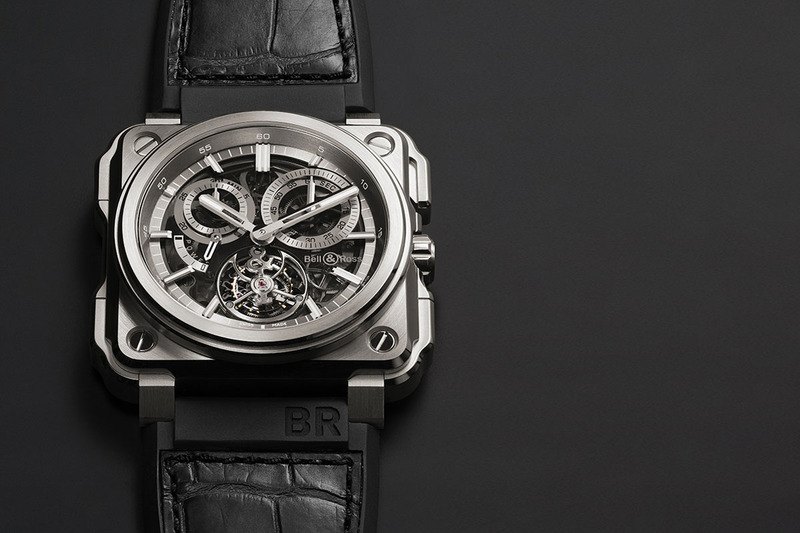 Slightly asymmetrical, a lip runs along the right-hand side of the case (where the crown and chronograph pusher are located). It’s not a proper crown guard as such, although the crown does nestle into it slightly. 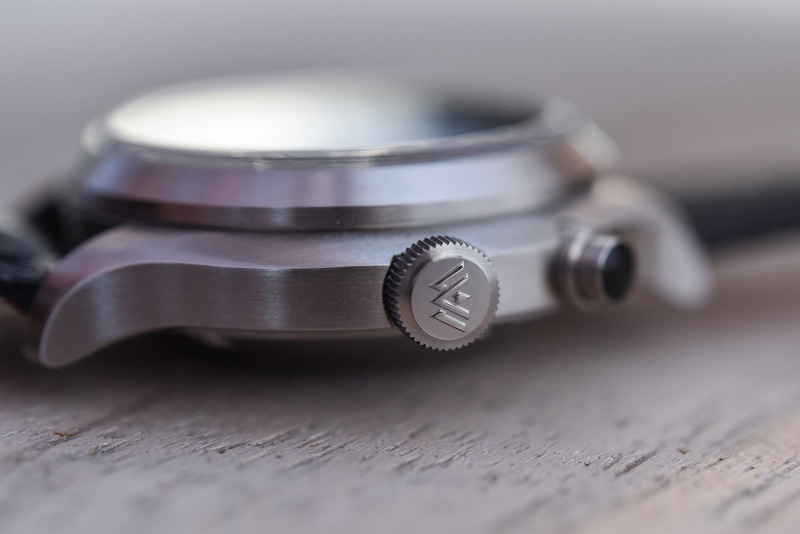 In any event, it gives the case a bit more character and helps make the watch wear very comfortably on the wrist. That’s particularly important given the height which the double-domed box crystal glass adds. I will say though that the height wasn’t as noticeable as I was expecting once the watch was on. The layout of the dial is very similar to those of the original Dirty Dozen. Black, with large white Arabic numerals and railroad style minutes, it is highly legible at a glance. On this new Vertex MP45, the signature raised numerals are reincorporated – blocks of luminescent material applied to the dial. 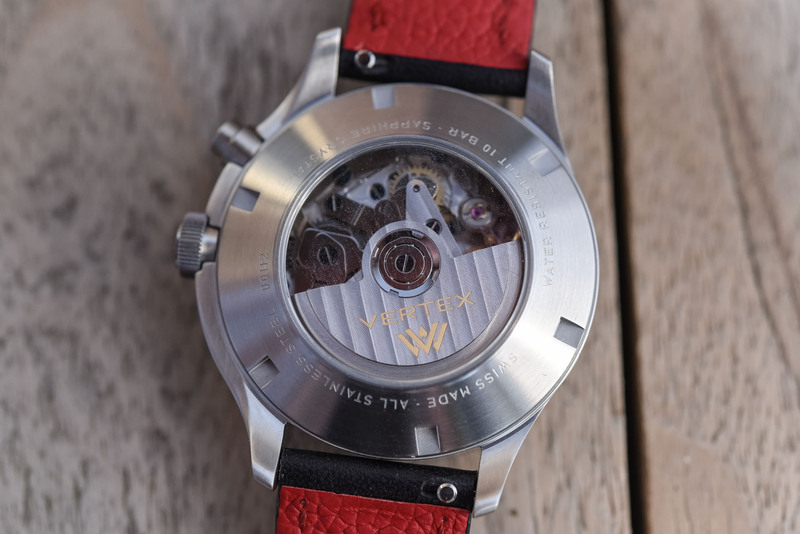 While being rather discreet and “standard” when looked at from a certain distance, this 3D effect appears after a closer inspection – and that gives this watch a unique character, as with all Vertex watches. 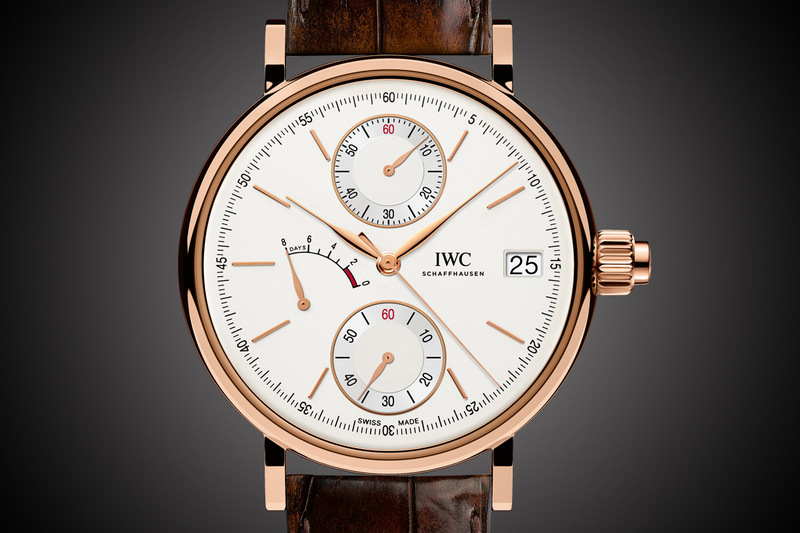 The big change, of course, is the introduction of twin registers for the monopusher chronograph. These also have black backgrounds with white text and have been snailed for added contrast. Running seconds appear at 9 o’clock, while the 30-minute counter is at 3 o’clock. 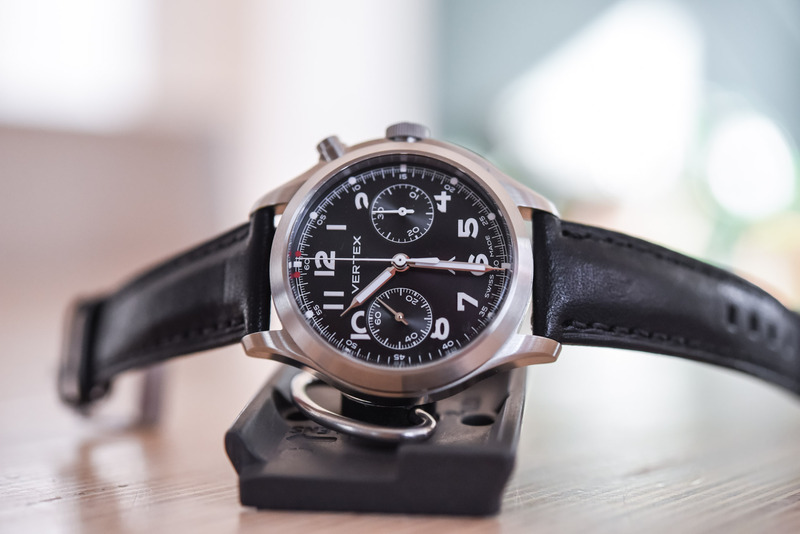 Chronograph seconds are shown centrally, as are the hour and minutes. As you might expect, the dial and hour and minute hands have been generously treated with Super-LumiNova to maximise legibility in low-light conditions. 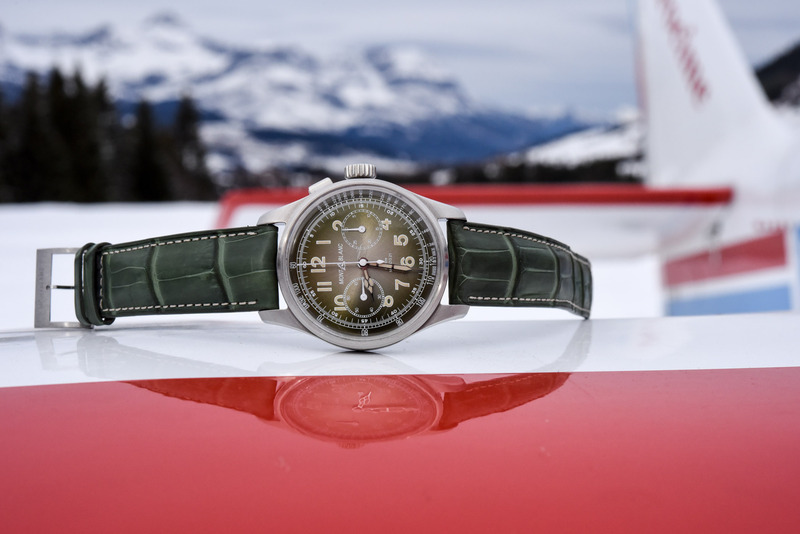 Completing the dial is the military Broad Arrow just above 6 o’clock. Also known as the “Crows Foot”, this common heraldic symbol depicting an arrowhead has long been the standard British military ownership mark. It appears on most items produced by and for the British Military (including the original watches in the Dirty Dozen). Here its appearance is purely aesthetic but it’s a nice link back to the brand’s military past. 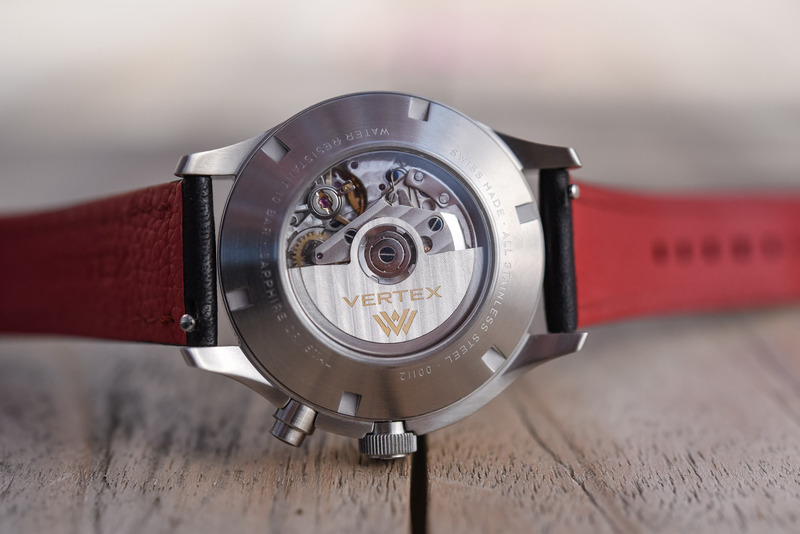 Given that Lemania is now a part of Breguet (and thus belongs to the Swatch Group), Vertex turned to a different Swiss manufacturer for the movement; Sellita. You can choose from either a manually-wound or automatic movement, both are based on the Sellita SW510 MP. Both feature a spiral pattern with polished bevels and blued screws. As I mentioned before, the MP45 is a monopusher chronograph. That means you start, stop and reset the chronograph via a single pusher, which is conveniently located at 2 o’clock. The movement is based on a Valjoux architecture, chosen for its reliability and ease of service. The watch is worn on a black leather strap with an attractive red lining. A quick release means you can easily switch between the additional rubber and NATO straps supplied without the need for tools. In keeping with the military theme, the MP45 is presented in a military flight case, which is virtually indestructible. Both versions of the MP45 (hand-wound and automatic) are available in a limited run of 200 pieces. Well-made, robust and comfortable, both are priced at GBP 3,480 (approx. EUR 4,050 at the time of publishing) and can be purchased directly through the Vertex website. Isn’t Lemania owned by Montblanc now? Minerva is owned by Montblanc…. Nice watch, affordable, as it has interchangable straps perhaps a nylon one then it would not be sticky in hot weather. I wish they’ve done it differently. A plexi crystal, Manual winding movement and a more vintage looking dial at least. This dial is too modern and kills the aesthetics of the watch. Charge the same price and do it more WWII accurate since that was the plan! I am guessing one needs an invitation code to buy one of this watch, just like their first batch of dirty dozen M100 watches? @Alex No need for this watch. This seems overpriced and a bit underdeveloped IMO. 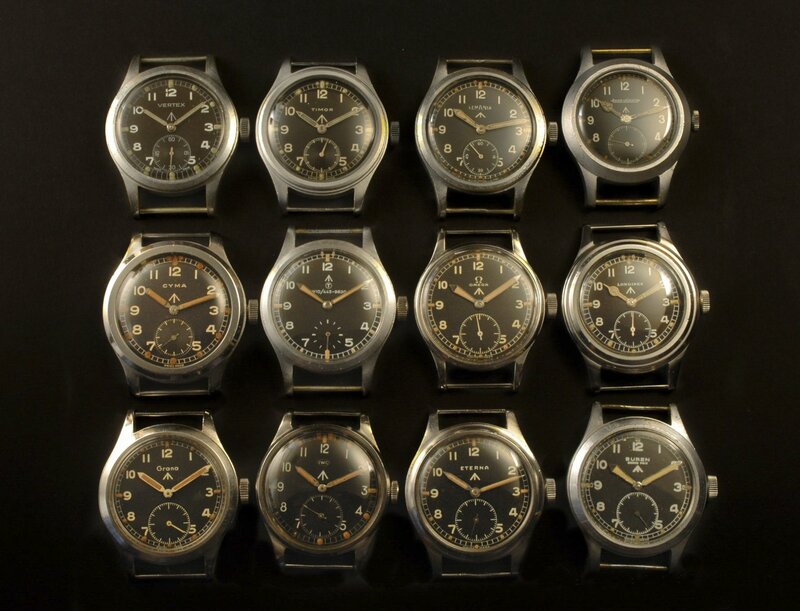 But I am looking for a modern dirty dozen watch. Does anyone know of any good quality pieces? Does case higher vary between auto and manual ?